by Adam Lechmere -The Macau businessman who has bought Chateau de Gevrey-Chambertin is definitely not in it for the money, his neighbour Eric Rousseau says. 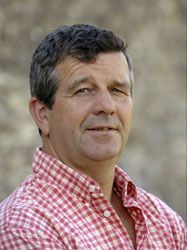 Rousseau (pictured), owner of Domaine Armand Rousseau in Gevrey-Chambertin, is leasing Chateau de Gevrey-Chambertin’s two hectares of vines from casino executive Louis Ng.Ng caused a storm of protest when it came out that it was he who had bought the chateau last year from the Masson family, after the death of owner Elisabeth Masson. ‘He’s a good guy. He’s not here just because there’s money – he genuinely loves Burgundy.’ As part of the contract with Rousseau, Ng will take six barrels or around 1,500 bottles a year, out of a total of 15 barrels. ‘It could have been very different. Louis Ng is not just a businessman. He’s not going to take the entire production of wine back to Macau.’ Rousseau also said the negative press coverage might spur the government on to change inheritance taxes to make it easier for owners to keep land, and ‘not have to sell something that has been in the family for centuries’.